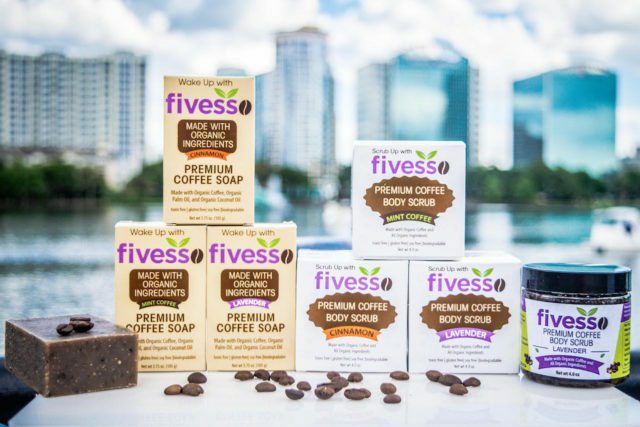 ORLANDO, FL – Today, Fivesso, a Premium caffeinated organic coffee soap and body scrub company, is launching a Kickstarter Crowdfunding campaign to promote their line of caffeinated organic coffee products. Fivesso Soap Bars are the first soap bars to use 100% organic certified oils! By scrubbing the body with Fivesso soap bars and scrubs, you receive an energy boost from the caffeine and rejuvenate your skin with the organic essential oils. Fivesso soap bars and scrubs also contain organic coffee grounds that gently exfoliate the skin while you bath or shower. The coffee soap bars and scrubs are packed with five organic oils: olive oil, coconut oil, jojoba oil, palm oil and a selection of scent oil (peppermint, lavender, or cinnamon). Together, these five oils moisturize the skin, leaving it feeling smooth and protecting it from dryness. Three scents are currently available: mint coffee, cinnamon, and lavender. Fivesso products does not have harsh chemicals, such as artificial dyes or parabens. Fivesso was created by co-founders Michael Wong and Eric Layton, two entrepreneurs who met at the University of Florida in 2009 and since then have created several lines of Fivesso coffee products. Energize the day with Fivesso and help support Fivesso. You can visit their campaign at www.fivesso.com/kickstarter Also, Check out their website: www.fivesso.com to find out more detailed information. Next articleCoffee students are up for the cup!